Mignonne is pleased to introduce our latest featured local artist! Valerie J. Cochran grew up in Missouri and arrived in the Bay Area on January 1, 2001. She currently lives and works in Oakland. Valerie has been shooting photography since she was a young girl and began with Polaroids of her family. She took her first photography class at the age of 15 and studied for a few years at the Savannah College of Art and Design although she did not obtain a formal degree. In 2004, Valerie began her photoblog, YourWaitress.com. Her return to photography was documented in the early days of the website which has become a home to her now usual suspects of street photography and portraiture. Valerie's images today explore the relationship between people and places in the urban landscape. She shoots only film photography with various 35mm, disposable, and toy cameras. Valerie's photographs have appeared in print publications such as JPG magazine and PhotoJournal Southwest. Her work has been featured in numerous other publications online including the BBC, Photoblogs Magazine, FILE magazine, Flak Photo, Filmwasters.com, and SFist. 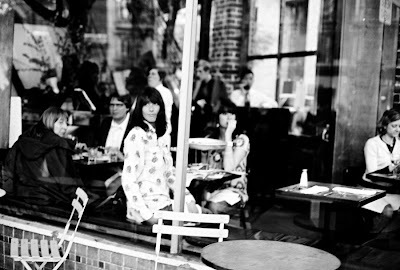 In February of 2007, she self-published her first photography book collection, your waitress | 2004-2005. Valerie's work will be featured in our next Oakland Art Murmur late night reception.